The Airports Authority of India (AAI) has provided an ambulance service with Advanced Life Support Systems (ALS) for Longding District of Arunachal Pradesh under its CSR Initiatives. 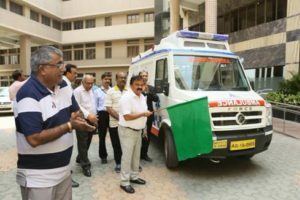 Flagging off the service, Dr Guruprasad Mohapatra, Chairman, AAI said that the ALS ambulance will bring a big relief to patients in remote areas and will be a great support to the Primary Health Centre facility in the Longding District of Arunachal Pradesh, an official statement said. AAI had, in the past, provided similar ambulance facilities to the Primary Health Centre at Pakyong, Sikkim, and also to Dr.Shakuntala Misra National Rehabilitation University, Lucknow and Primary Health Centre at Udaipur, Rajasthan.